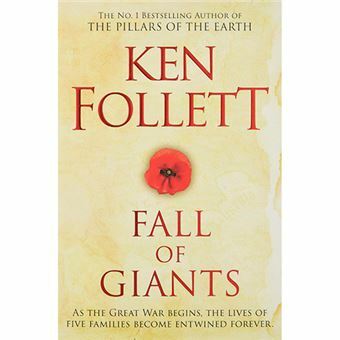 The first in Ken Follett's bestselling Century Trilogy, Fall of Giants is a captivating novel that follows five families through the world-shaking dramas of the First World War, the Russian Revolution, and the struggle for votes for women. A WORLD IN CHAOS 1911, a thirteen-year-old boy, Billy Williams, begins working down the mines as George V is crowned king. The escalating arms race between the empire nations will put not only the king but this young boy in grave danger. A TERRIBLE WAR Billy's family is inextricably linked with the Fitzherberts, the aristocratic owners of the coal mine where he works. And when Maud Fitzherbert falls in love with Walter von Ulrich, a spy at the German embassy in London, their destiny also becomes entangled with that of Gus Dewar, an ambitious young aide to Woodrow Wilson, and two orphaned Russian brothers, the Peshkovs, whose plan to emigrate to America falls foul of conscription, revolution and imminent war. A REVOLUTION THAT WILL CHANGE EVERYTHING When Russia convulses in bloody revolution and the Great War unfolds, the five families' futures are entwined forever, love bringing them closer even as conflict takes them further apart. What seeds will be sown for further tragedy in the twentieth century and what role will each play in what is to come?